The Jerome Beillard Festival for Life celebrates 30 years on Saturday, November 17, 2018! The 30th Anniversary of the Jermone Beillard Festival for Life will be held on Saturday, November 17, 2018, at the Tucson Convention Center, Crystal Ballroom. December 8, 1989, was the first Festival of the Trees, a fundraiser for the People with AIDS Coalition of Tucson (P.A.C.T). The event auctioned off nearly 200 decorated trees and wreathes for the holiday season. 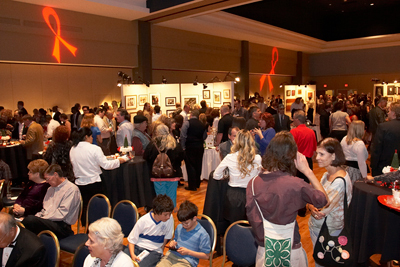 Over the years, the event grew and in 1992, Festival of the Trees became Festival for Life adding artwork, menorahs, and celebrity items. That year also had a special appearance by Miss Mary Wilson, formerly of the Supremes. In 1995, P.A.C.T.’s co-founder and Executive Director, Jerome Beillard, passed away from AIDS complications and Festival for Life was renamed to the JerA?me Beillard Festival for Life – honoring the work and spirit of a great man. Each year added amazing artwork, designer Christmas trees, gift baskets, celebrity items, and sculptures. Each year also added local sponsors and community members all supporting the same cause. In 1997, when the three AIDS Service Organizations merged to create the Southern Arizona AIDS Foundation (SAAF) – the Paper Prayer Benefit from the Shanti Foundation was added to Festival for Life. Local artists, students, and others create strips of art that represent an ancient Japanese tradition of giving a person who is ill a Paper Prayer as a gift to bring good health. Each year, Festival for Life continues to sell hundreds of Papers to Prayers to be used as cards and tokens of good health. This event benefits the programs and services of the Southern Arizona AIDS Foundation (SAAF). Check it out…we have just added all kinds of fun new stuff to the Festival for Life Live & Silent Auction items page, including a trip to Napa Valley! With more than 500 items up for bids in the live and silent auctions, you are bound to find a few things that are true must-haves!